Seminar paper from the year 2011 in the subject Psychology - Miscellaneous, grade: A, Norwegian University of Science and Technology (Psychological Institute), course: Introduction to Individual and Context, language: English, comment: Note A bedeutet laut NTNU: An excellent performance, clearly outstanding. The candidate demonstrates excellent judgement and a high degree of independent thinking., abstract: In the United States of America, a high degree of attention has been paid to the issue of how to legislate abortion. During the past two decades, notions of the so-called Culture-Wars" emerged, referring to an increasing polarization of the American public over the abortion topic along the lines of religiously motivated pro-life" and secular pro-choice" activist groups. This paper is an effort to analyze from a psychological perspective how religiosity mediates people's attitudes towards abortion legislation, the hypothesis being that the more embedded a person is in an increasingly conservative religious community, the less likely she will be to experience cognitive dissonance over ambivalent topics like abortion, because she adheres to the amplified religious position on it. 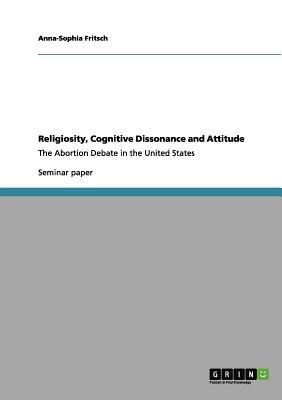 It was found that religiosity leads to more dismissive attitudes towards abortion in general. Furthermore, the more conservative a religious denomination is in the terms of Bible literalism, the stricter is the view of its adherents that abortion should be forbidden by law in most or all cases. As Bible literalism entails the belief of being indisputably right about any issue touched by it, it leads to attitude persistence, which keeps the pro-life" and pro-choice" activist groups from finding a compromise. However, contrary to what the Culture-Wars"-hypothesis suggests, data from public opinion polls do not show an increasing polarization in attitudes over the issue.